I woke up early again, disturbed by the breeze, which wasn't as strong as the winds of a few days ago but it doesn't take much to get the tent flapping around. I was away at 7:30 for the final day of riding. I followed the alternative coastal route, a pleasant little single track lane which I think used to be the main Road to the Isles. It turned onto a cycle lane alongside the main road for the last stretch, and then I was in Mallaig. The ferry to Armadale was short and sweet, and then I was back on Skye, on the Sleat Peninsula which was luscious, green and smelled of wild garlic. The road mostly followed the coast for a while, then turned inland towards Broadford. The sun was scorching by this point, it was July weather at the beginning of May (and I'm not talking about the previous year's July which was depressingly rainy). The roads were big, wide, straight, empty and fairly flat. I normally hate roads that big but occasionally it's nice to hunch down on a big stretch of tarmac, shift up to the big chainring and go for it. The miles rolled by and soon I was back on the A87 road where I'd started out my journey, and turning towards Kyle of Lochalsh. It really isn't a great road. The surface is quite poor and it's full of fast lorries. 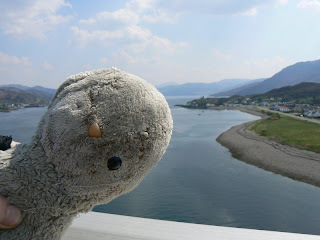 Grey Mouse and I stopped on Skye Bridge for a final holiday snap, and then arrived in Kyle with about four hours to spare before the train left. I went into the nearby pub for soup and chips. Some pubs like to proudly announce that their food is home cooked, that's great and all but some of them really shouldn't bother. My chips were actually potato wedges and impressively managed to be soggy on the outside and hard on the inside. The train eventually left for Inverness. Unlike the outward journey ten days earlier, today was a clear and sunny day so it was a little easier to appreciate the scenery as we passed by mountains, lochs and moorland. I even saw a few deer. I wasn't lucky enough to get a cabin on the sleeper train this time but the reclining seats were surprisingly comfortable. I was a little concerned at first that the seats all around me appeared to be reserved, and worried I might end up next to a drooling stranger all night, but as the evening drew on and the train left it became apparent that those seats were reserved for me, to allow a bit more space since there weren't many passengers. I spread out across two seats and slept very well. Getting home was fun, I won't go into the boring details, suffice to say that if you book advance train tickets for a journey in the south of England while you're in the north of Scotland, make sure you leave a spare couple of hours to allow various different operating companies and call centres to get their act together so you can actually pick up a ticket.